Timothy Green Beckley is a UFO expert and the author of "The UFO Repeaters - Seeing Is Believing - The Camera Doesn't Lie." 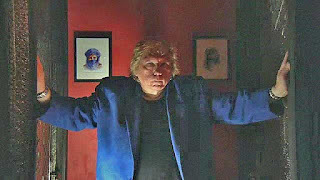 Check out our earlier interview with Beckley about celebrity UFO sightings. Was raised in a haunted house and had my first of three UFO sightings at the age of ten. I have edited over 30 newsstand magazines including UFO Universe which was published for 11 Years. I have been on such shows as UFO Hunters, Mysteries In The National Parks/Travel Channel, William Shatner's Weird Or What? Coast to Coast AM. I have my own pod cast Unraveling The Secrets and Mr UFOs Secret Files YouTube channel. Am editor of the print edition of the Conspiracy Journal and am head of Inner Light Publications, with over 200 titles. Describe your book in a few sentences. OVER 100 NEVER BEFORE PUBLISHED UFO PHOTOS! Here are well documented cases of those rare individuals who claim an to have experienced an ongoing series of encounters with UFO occupants – and have the uncanny ability to take remarkable photos of their craft on an ongoing basis. – Some showing the aliens themselves! 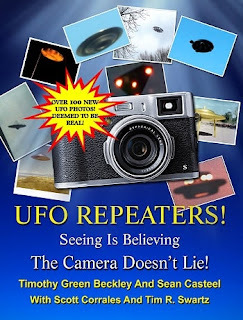 “UFO Repeaters: Seeing Is Believing! The Camera Doesn't Lie” offers a wonderful opportunity to see and ponder dozens of new photos taken by a tiny segment of humanity -- those who the UFO occupants have selected to reveal themselves to on a one to one basis over a long period of time. Fans of the X-Files, Close Encounters, Ancient Aliens, UFO Hunters, and a host of podcasts devoted to UFOs and the Paranormal. What inspired you to create a book that features photos from UFO repeaters? I have been listening to their accounts for years and feel that most of these individuals have had credible experiences which the vast majority show no interest in listening to. We offer a sympathetic ear. Many of the individuals in your book have the ability to “call down” UFOS. Can you elaborate a bit on this phenomenon? Uusually it starts with a sighting of a UFO along a dark road and ends with a telepathic message that they have been "selected" for a close encounter. They are contacted initially and told to go ut and to bring their camera, and it turns out they are able to snap away and capture some of the most remarkable and bizarre sights in the unknown universe. One of the questions you ask in the book is: Do the aliens keep track of their “Chosen Ones”? Can you explain to readers why it is important to answer this question? There are certain people who because of genetics or blood type seem to be more responsibe to contacts the aliens who have been appearing in the heavens since the beginning of recorded times. Some of the UFO Repeaters actually claim to be "Walk-Ins" who have taken over the bodies of humans or have been reincarnated here. Its a heady tale, but we need to listen to see what they have to say and examine the photos they have taken -- some are remarkable. How did you track down the various UFO repeaters featured in the book? Since I have been writing on this topic since the 1960s, editing magazines on the subject,and appearing in public most of the repeaters find me, I don't have to go out of my way to track them down. For example, Marc Brinkerhoff who lives in NYC I have known for years and he take pictures of UFOs over Central Park and outside his apartment window. every country you can name. Some of the best videos were taken by a UFO repeater in Turkey. The UFO coming in from over the coast line has been witnessed by dozens of individuals. Its not a secret any longer! I think it will convince some who are not familiar with the topic that much that it is a legitimate subject for scientific evaluation. Others will just be enticed by some very entertaining -- spacy - tales of the strange and unknown. We put out maybe 3 or 4 new titles every month. We have a book on celebrities such as Jackie Gleason, and David Bowie who have undergone UFO sightings and know that we are not alone. People from all walks of life can have such experiences. nuts and bolts vehicles -- NOT just lights in the sky!